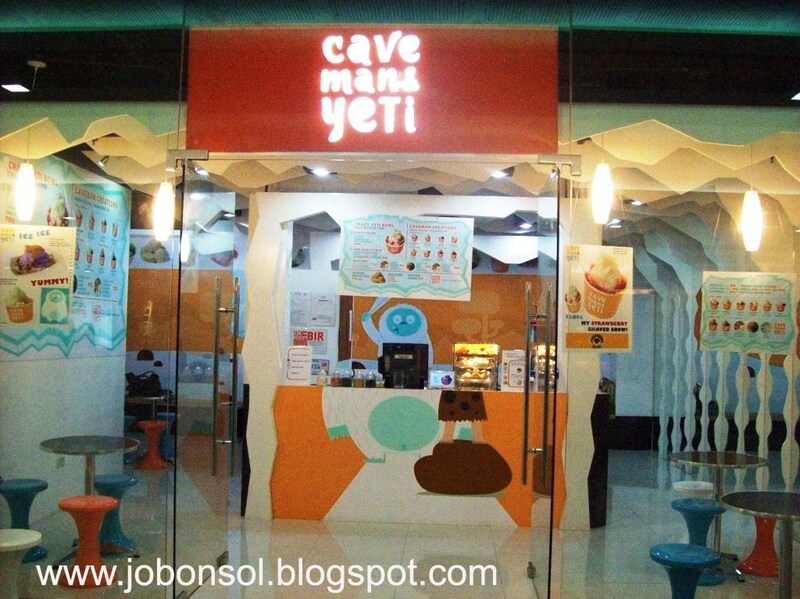 Review: Awaken the child in you with Caveman and Yeti shaved ice! There is always a child in all of us. When I was a little girl, I've always wanted to play with my food. I guess you felt the same wanting to make shapes out of every food served to you. I came from a professional monthly meeting of school paper advisers today and dropping by SM North, we were captivated by the name - Caveman and Yeti. It reminded me of the movie, "The Mummy:Tomb of the Dragon Emperor" with Jet Li and Brendan Fraser. 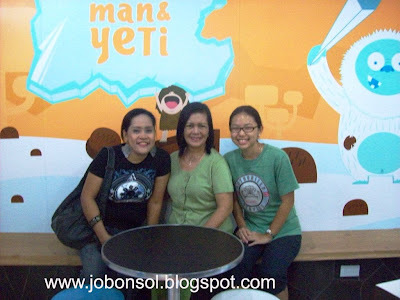 It reminded me of the cute-looking Yeti and how I'd love to experience playing snow and shaved ice when I was young. I need not dream anymore because I can simply go to Caveman and Yeti and have all these treats with that experience to play with your ice and create your own. 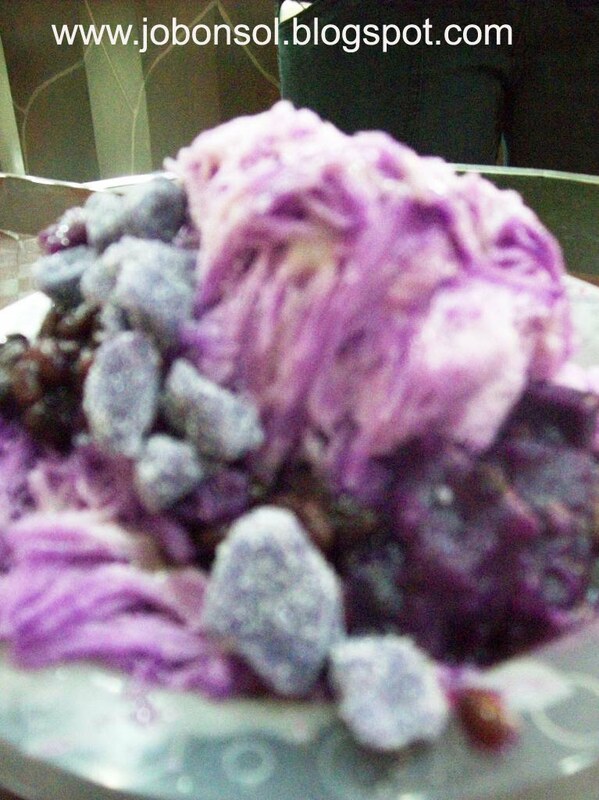 This Ube Mungster (P68/regular 128g) is their bestseller with yummy ube flavored shaved ice and ube syrup and ube bits is also topped with monggo beans(and with optional topping of ube pastillas) to surely captivate the palate of not just the young ones but the mommies and daddies who'd go play with their kids at Caveman and Yeti. 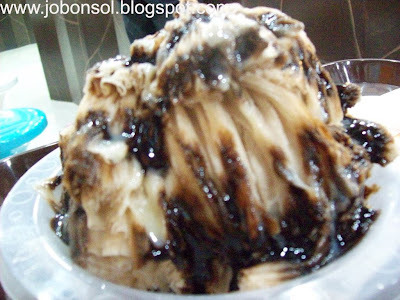 Mrs. Yolanda Abis, the new President of the Quezon City Secondary School Paper Advisers Association shared with me this Choco Nilla (P68/regular 128g) of chocolate flavored shaved ice with chocolate syrup and chocolate bits (with optional other toppings of your choice at P20/each). 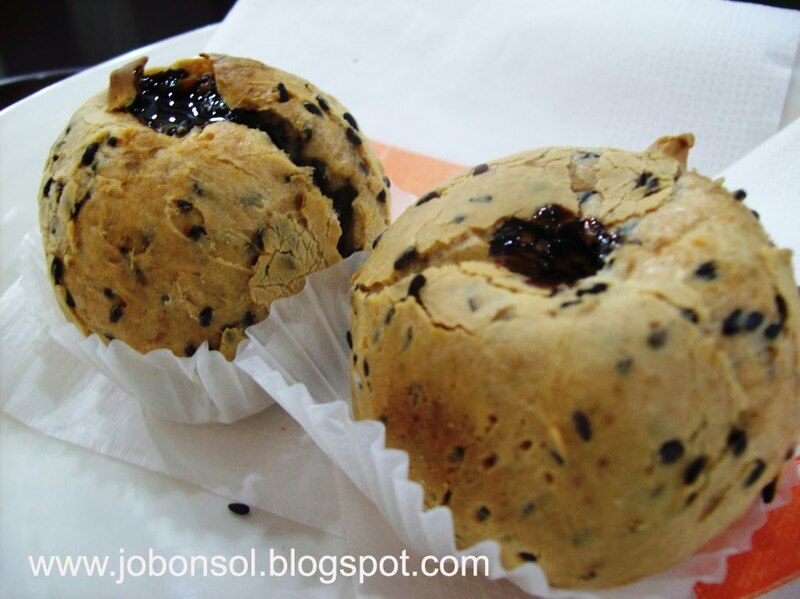 When asked what particular food would go with the shaved ice, we were offered this Sesame Mochi Bun (P20/each), a crunchy outside chewy inside black sesame seed bread with sweet beany paste filling really surprisingly delicious and worth a try. I have tasted so many mochi from different restaurants and packed mochi bread in the grocery but what makes this different is the texture of "bagel-like" chewy-inside-crunchy -outside texture frozen and served toasted hot to give a perfect yummy bread experience. 1. You know you'd want to get that child in you to try beating that Yeti Challenge of shaving your own tallest tower of ice with the tallest Crazy Yeti Bowl. The staff would gladly teach you how and if you beat the record of the customers who tried, you may even be awarded Yeti of the Month with prizes that include a regular Yeti Creations free everyday of the month. 2. You are quite adamant with other frozen desserts knowing they use milk products that may actually gain you more weight. Caveman and Yeti uses skim milk and more of ice to keep you away from those fatty foods and make you play before you eat your creations. 3. You'd want to treat your kids and even yourself to another culinary experience that will teach you how well you choose your favorite ingredients to make a creation of your own shaved ice dessert, experiment and taste is always an adventure. 4. You got tired of frozen yogurt and frozen ice cream and would want to try something different to treat your kids and your whole family. 5. The hot weather in the Philippines would always invite you to get that flavored shaved ice. Their friendly and well-trained staff would gladly assist you of activities for your kids and how to create your own Yeti at your convenience. Amazing how young urban professionals like Dazzle Ng of Caveman and Yeti found another creative learning and dining experience the children and the adults can now enjoy with shaved ice. 1. that Yeti or also called the Abominable Snowman is a mythological creature appeared in many video games like RuneScape, Diablo II, Cabela's Dangerous Hunts 2, Zoo Tycoon, Guild Wars Factions, World of Warcraft, The Legend of Zelda: Twilight Princess, The Legend of Kyrandia: Hand of Fate, King's Quest III, King's Quest V, Tomb Raider 2, MapleStory, SkiFree, Uncharted 2: Among Thieves, PoxNora, Final Fantasy VI, Final Fantasy XII, Baldur's Gate: Dark Alliance, Tintin In Tibet, NBA Street, Plants vs. Zombies, Castlevania: Dawn of Sorrow, Pokémon Diamond and Pearl, Titan Quest, Carnivores: Ice Age, Silkroad Online, Spyro 3: Year of the Dragon, and Crossbow. 2. Our interest in Yeti dates as back as 1921 with the book, Royal Geographical Society "Everest Reconnaissance Expedition" by Lieutenant-Colonel Charles Howard-Bury.In the book, Howard-Bury includes an account of crossing the "Lhakpa-la" at 21,000 ft (6,400 m) where he found footprints that he believed "were probably caused by a large 'loping' grey wolf, which in the soft snow formed double tracks rather like a those of a bare-footed man"
I will definitely go back to Caveman and Yeti and do the Yeti Challenge next time with my son. saraaaaaap! i've tried it and my favorite is ube mungster with ube pastilas mmmmmm.... will go back to try the mochi buns! i've known about it on tv.... kanina lang it was featured in that negosyo show of abs-cbn and now i've been craving for it! Hello! I knew this when i was in Hong Kong. It is very creative and good. The way they created was so fantastic. I can't wait to try one of your products. I hope you both try Caveman and Yeti at SM North EDSA, their friendly staff will definitely not just satisfy you but make you feel comfortable eating those yummy shaved ice and mochi buns! For most recent news you have to pay a visit web and on internet I found this site as a most excellent website for newest updates.